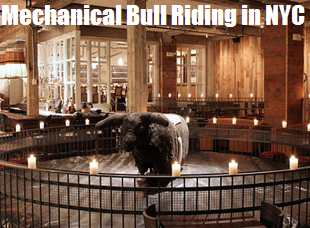 Johnny Utah’s is located in Rockefeller Center and is home of NYC’s only mechanical bull. Johnny Utah’s has redefined the urban cowboy experience through unique promotions and rowdy atmosphere. How do I sign up for the bull? You will need I.D. (Government-issued passport or state-issued driver’s license) to sign the waiver and you must be 18 years of age or older to ride. Once you sign the waiver you will receive a stamp on your hand good for the whole night. Have a drink, muster the courage, and jump on! How much does it cost to ride the bull? The bull is FREE to ride and is available during all normal hours of operation. Mechanical bulls are designed to be comparative to a real bull ride. Our bull is operated by a trained employee, who will give you a fun and challenging experience! Of course! Just like any activity, there is assumed risk involved. Our ring is completely lined in padding and offers a safe landing area. However, it is a “ride at your own risk” attraction. We’re all about the party here, and will host advertised as well as sporadic contests. They may be just for fun, as well as prizes, so start practicing!